A sculpture commemorates the role horses have played in the development of Australia and identifies Scone and the Upper Hunter Valley as the horse breeding capital of Australia. 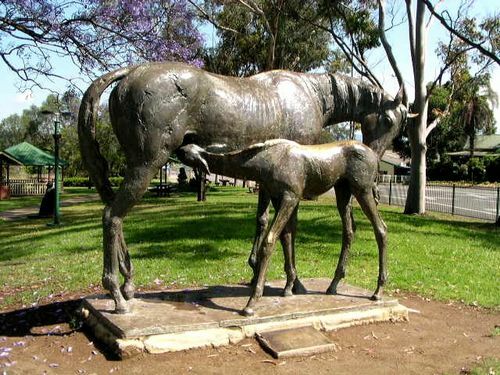 The Mare and Foal Sculpture was an idea conceived by a local grazier in 1979 to signify the importance of horses in the area. Scone has over 65 horse studs in the region and is largely responsible for providing quality horses for both the racing and stock industries nationwide, with the Mare and Foal statue erected in 1982 to commemorate the area’s best known industry.